Without doubt my life is a privileged existence for which I am profoundly grateful. Whilst I may not be wealthy as far as money is concerned, life affords me a wealth of such variety and abundance I could never hunger or thirst. I am a working pagan druid that spends most of my time trying to understand the meaning of life. I have the gift of being married to a musician who is popular around the world and so we spend a lot of our time travelling the globe, meeting people and making friends. This affords us many new experiences, a wider view of life, deeper insights into world politics, religion and history. We get the chance to hear the realities of living in different lands, the ups and downs and truths that the media don’t show in their sound bite view of global events. We were recently in Prague where Damh was performing and I presented a ritual/clay workshop. We have shared many great times in the Czech Republic drinking their amazing beer (I don’t normally like beer, but Czech beer is yummy) and learning about the life and times of the people, both ancient and modern, it has been a real eye opener over the years to hear about the difficult times the country suffered. This was my third workshop and the theme this time was connecting with the ancestors. To this end we built clay skulls to represent the ancestors of blood, bone and spirit. The stories we shared throughout the workshop were of traditions and wisdom passed down through the generations, particularly ones that had shaped their family’s attitudes and how they engaged with the land, we also spoke how they honoured their departed in the Czech culture, which is still a profound and regular part of peoples lives in a way that we seem to have lost to a large extent in Britain. 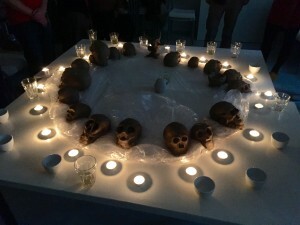 When the skulls were complete and the stories told we then made a short but moving Samhain ritual to honour those ancestors of blood, bone and spirit. We made a circle of the skulls and lit a candle with a dedication to them and then drank a toast the departed. As working Druids we get to exchange spiritual ideas particularly in workshop/ritual settings, either ones we attend or provide. Learning the difficulties pagans around the world have struggled with to find and then express their own beliefs is a powerful journey to share. Within the sacred space of a workshop or ritual we feel safe to share deep journeys of the soul, whilst immersing ourselves in spiritual creativity. Workshops particularly bring to light the interplay of our nature, nurture, culture and environment, highlighting our profound understanding of the world in which we live, both as individuals and as social animals. It is a truly moving experience to be part of this kind of energy. As pagans from an reasonably stable island landscape (though maybe not politically at the moment), with gentle environment (nor maybe even environmentally if this fracking lark really comes to fruition), as far as weather and land can ever be, and one that has wiped out all dangerous animals (despite what the government say about foxes, badgers etc, sorry about the politics just can’t help myself), we are often happiest experiencing the wild spaces where ever we can on our travels. There is a certain frisson to anticipating the call of a coyote far off in an American woodland, to know there are bears picking through the camp garbage and alligators in the lake just a few feet away. Or to be aware of a thousands creatures, all unseen, that could kill you with a single bite in Australia; not to mention scare the living day lights out of you with their enormous size, even if they are not deadly. No really my lovely Australian friends, baby Huntsmen spiders are not cute, or small! Our excitement at seemingly everyday occurrences often makes us seem a bit crazy to the folk we are with, but when you live a generally cosseted and safe existence on a tiny island where nature is thoroughly tamed, to know that there are mountain lions wandering around free and hungry, is a bit of a thrill to be honest. You get a particular insight into human and particularly pagan psychology when the environment decides to lend its energy to the workshop/ritual, as has happened on many an occasion around the world. One event comes to mind to share from a few years ago. We were running a Magical Poetry workshop in the U.S., when there happen to be an epic storm building right above us. It looked for all the world like it might just bring armageddon in its wake. Tornado warning sirens had sounded and everyone was understandably tense. Our instructions, if a tornado touched down, were to follow our friend into the male toilets (it was a small, sturdy building unlikely to submit to the onslaught of a tornado), tuck ourselves under the toilets bowls (bolted to the floor) and hang on for dear life. The clouds were unlike anything we had seen, strange shapes and a greenish hue. Most people stopped what they were doing to watch the developing drama above and keep their weather apps open to chart the progress of the storm. Though dizzy at the majesty of the event and more than a little desperate to take in the might of the Mother in one of her fiercest and most dangerous moods, I was conscious of the workshop we where in the middle of, so I returned with our hardy group to sit inside our large, open plan building, to continue the process we had begun. It was a a beautiful thing to hear the poems that had been created in the energy of a building storm and we all felt good in the completion of the task. Damh in the meantime had gone outside to join with Selina Fox and others in a magical bid to divert the storm away from the area and ask it to dissipate, which thankfully it did. In fact the storm actually split in two and went around either side of the area occupied by the camp, the two halves rejoining after it had passed us by. In truth I am one of those strange and probably disturbed people who would risk life and limb to stand before the power of the Goddess in her Tornado aspect. In the same way I have stood before the crashing seas and on the mountain’s edge to feel the power of the Earth and understand my place in the grand scheme of this existence. It is a sobering thought that what I amount to is barely a flicker on Her grand countenance as we spin through the eternal night, these facts that keeps me focused on the realities of life, the universe and everything. As I say I am profoundly grateful for the opportunities to open myself to the abundance and diversity that life on this amazing planet provides: the experiences, the friendships and family. For the chances to challenge my perceptions at every turn and, in doing so, return home from every journey having gained more insight and understanding of this complex living organism that is our Mother. This is a wonderful ‘Thank You’ Cerri and a lovely way to express your gratitude. Well done to Dave for fixing the ‘link’ so I could read it! I am being grateful for having met lots of Druid folk this year – since I joined OBOD. It is a journey that every day brings challenges of ‘which thing to read’ or which ‘job’ to get on with. Money is certainly not in abundance in my life but I can pay the bills, and we get by.